"Part of me is feeling hope," said Arash Azizi, a New York University researcher, far from his home in Iran. "We see the rising up of the downtrodden." "But I am even more worried than hopeful," he added. More than 20 people have been killed and 450 arrested since a protest movement in cities and towns across Iran began in late December, and analysts say if it continues, the impact many not just be in Iran, but across the region. Mostly peaceful protests could turn into clashes and Iran's rivals are watching for the prospect of a weakened state, according to Reza Marashi, research director with the National Iranian American Council. Protesters are demanding an end to "mismanagement, nepotism and corruption," he said, and have called for the fall of the government in recent days. Unlike mass protests in 2009 against an election seen as illegitimate, the movement is without clear leadership, and normally outspoken activists in Iran have been largely silent. It is still not clear if the demonstrations will continue with the same velocity as they have in the past week. And if they do, according to Marashi, it is too early to predict an outcome. The 2009 protests lasted for months, but were ultimately crushed by security forces. Thousands of people were arrested and dozens killed. The election results were upheld. Current protests have attracted considerably smaller crowds, but in a larger number of cities and towns, said Marashi. "It's more important to see how it plays out over the weeks and months," he said. FILE - U.S. Ambassador to the U.N. Nikki Haley speaks in front of recovered segments of an Iranian rocket during a press briefing at Joint Base Anacostia-Bolling, Dec. 14, 2017, in Washington. Iran is embroiled in proxy wars with Saudi Arabia in Syria and Yemen, as well as funding Hezbollah, a Lebanese military and Israeli archenemy. It is also a key player in Iraq, and its internal politics have the potential to impact almost every corner of the region. Among the protesters' grievances are vast sums of money sent abroad while people are hungry at home. In the past two years, tensions between Tehran and Riyadh have become explosive, and Iranian officials have accused Saudi Arabia, the United States and Britain of having a hand in the protests. "This is a silly claim, with no basis in fact," said Mark Fitzpatrick, executive director of the International Institute for Strategic Studies' Americas office. "It is farcical because the Saudis have little influence in Iran." In recent days, protesters also began calling for the collapse of their government, demanding "Death to the dictator!" and "Clerics should get lost!" Among Iran's main rivals, this sparked speculation — or perhaps hope — that the Iranian government will fall or be damaged. For Saudi Arabia, this could mean a shift of regional power toward Riyadh as Iran's influence and ability to fight regional conflicts decrease, according to Khaled Almaeena, a Saudi political and media analyst based in Jeddah. "For too long, Iran has been interfering with other states," he said. 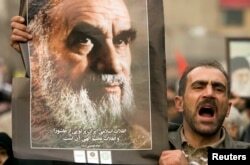 FILE - A man holds a picture of Ayatollah Ruhollah Khomeini, founder of the Islamic Republic as government supporters protest against opposition demonstrations during the holy day of Ashura, in Tehran, Dec. 30 2009. If the past is an indicator of the future, these protests are likely to lead to a violent crackdown if they continue, according to Azizi of NYU.And while many protesters have expressed a willingness to risk physical harm to achieve their aims, there has yet to emerge any alternative to the current government. "Some people say, If we want to bring down the Islamic Republic, I'm the first to sign up,'" he said. "'But what's next?'" Violence on Iranian streets may also increase the threat of clashes in other parts of the region, according to Josepha Ivanka Wessels, a senior researcher at Lund University in Sweden. "The prospect of major bloodshed at the hands of the state looms large and if that happens, the ensuing domino effect could create yet another volatile and explosive situation in an already stormy and dangerous region," she writes in The Conversation, a journal that features articles written by academics. Still, many in Iran are hopeful that the protests will inspire real change at any cost, according to Azizi. "People ask how long are we going to keep up this bizarre regime that takes up our blood and treasure to survive," he said. Iranian President Hassan Rouhani, widely seen as progressive and democratically elected, has spoken up for the public's right to express their grievances, but has also downplayed the protest movement. "Our great nation has witnessed a number of similar incidents in the past and has comfortably dealt with them. This is nothing," he told Iranian members of parliament on Monday. Other Iranian leaders have stressed that the death penalty will be applied to some protest-related arrests. If demonstrators are not dissuaded by this threat and the lack of alternate leadership, some analysts say even continued protests may have no immediate impact. "The regime has full control of all security forces as well as the judiciary, the communications networks and other sources of power," said Fitzpatrick. "So far, it has been retrained in exercising these tools of force, but it will not hesitate to do so if the protests grow to the point where they might be seen as threatening the regime's hold on power." In the context of Iranians' long-term internal struggle for civil and political rights, these protests are significant, added the National Iranian American Council's Marashi. "Iranians strive for democracy, not revolution," he said.